OrganoClick has been selected to this year's Sustainia 100 featuring 100 leading sustainable innovations. The list was recently announced at a big gala in Paris. Behind Sustainia 100 is the independent sustainable think-tank Sustainia with a focus on identifying and advocating sustainable innovations globally. This year more than 1 500 innovations were nominated from six continents of which 100 were selected. The selection was based on three dimensions of sustainability; environmental, social, and economic. The solutions are thereafter selected based on if they are readily available, scalable, financially viable, improve quality of life and create a positive environmental impact. Partners to Sustainia 100 are the UN Global Compact, Connect4Climate, Regions20, WWF, DNV GL, Realdania, Storebrand and International Federation for Housing and Planning. Former Governor of California Arnold Schwarzenegger serves as Honorary Chair of SUSTAINIA. 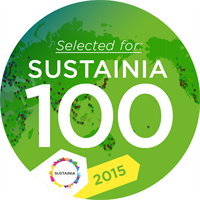 "We are very proud of being selected to Sustainia 100. That such well renomated global think-tank see the potential in our technology and products is another proof that we develop and produce something of great global importance", comments Mårten Hellberg, CEO OrganoClick. To lean more about Sustainia 100, please visit their homepage at www.sustainia.me. To see the full Sustania 100 list, please click here. OrganoClick AB (publ) is a public Swedish cleantech company listed on Nasdaq First North. The company develops, produces and markets functional materials based on environmentally friendly fiber chemistry. Examples of products that are marketed by OrganoClick are the water repellent fabric treatment OrganoTex®, the flame and rot-resistant timber OrganoWood® and biocomposite materials. OrganoClick was founded in 2006 as a commercial spin-off company based on research performed at Stockholm University and the Swedish University of Agricultural Sciences within environmentally friendly fiber chemistry. OrganoClick has won a number of prizes, such as "Sweden's Most Promising Start-up" and "Sweden's Best Environmental Innovation", and has also received a number of awards, such as the WWF "Climate Solver" award and has also appeared for two years on the Affärsvärldens and NyTekniks list of Sweden's top 33 hottest technology companies. OrganoClick has its head office, production and R&D located in Täby, north of Stockholm. OrganoClick's Certified Adviser on Nasdaq First North is Pareto Securities AB. OrganoClick is a Swedish cleantech company that develops, produces and markets performance materials based on environmentally friendly fibre chemistry. Examples of products marketed by OrganoClick are the water-repellent fabric treatment OrganoTex®, the durable modified wooden material OrganoWood® and functional biofiber composites. OrganoClick was founded in 2006 as a spin-off company based on research in fibre chemistry at Stockholm University and the Swedish University of Agricultural Sciences. OrganoClick has won several prices such as "Swedens most promising start-up" and "Swedens best environmental innovation" and been appointed as a "Climate Solver" by the World Wildlife Foundation (WWF). OrganoClick is located in Täby, in the northern parts of Stockholm, where the company’s production, R&D, sales and marketing divisions are situated.